We're going to start with classes that have a connection to nature: druid, hunter, and shaman. to go along with the gnashing? Don't go skiing with that jerk. one of these instead of Marshmallow. 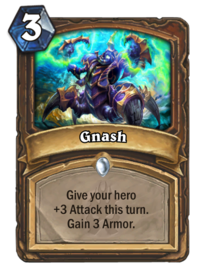 Gnash is a larger version of Claw, although you're getting +1 Attack and 1 extra Armor for 2 more Mana, which isn't as efficient as Claw, Mana-wise. It's also like a "compromise" version of Feral Rage, where you get both effects, only less Armor. Claw very rarely sees play, so far as I have seen. Feral Rage sees regular play, even in decks that don't carry Fandral (for the Choose One synergy). I'm on the fence about this card because of the widely divergent fates of its existing analogues, so I think I'll give it a Poor rating. 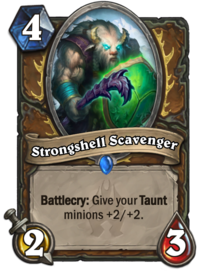 The Strongshell Scavenger has a potentially powerful Battlecry, but it's attached to a very weak body for its Mana cost. Druid decks right now don't run a lot of Taunt minions, so it doesn't seem like this would be very good. That said, this expansion is introducing several cards that allow druid to flood the board with Taunt minions, which this card could be used to buff, for preference on the same turn. For instance, if you generated 3-4 1/5 Taunts with Spreading Plague, then played Strongshell Scavenger, you'd have a pile of 3/7 minions on the board, which would make up for the Scavenger's body. Basically, this card's value depends on druid running a lot more Taunt than it does now. Whether that happens or not remains to be seen. I think this card is probably Poor, with its incredible niche use being counterbalanced by the quantity of strong Taunts druid can field. The Exploding Bloatbat is an upgrade on the Goblins vs Gnomes Explosive Sheep. Its +Attack isn't significant; what is is that it only hits enemy minions. The lack of reliable board clears are one of the things holding a slower, control playstyle back in hunter, so this is a start at having one. While the card is expensive at 4 Mana, that's the same price as Consecration. (In effect, instead of doing 2 damage to your opponent's face, you get a 2/1 body on the board.) The downsides of this card are that the effect is a Deathrattle, meaning you have to have a way to damage it on your own turn, or hope your opponent can't really play around it (or Silence or transform the card). It's a start, but like Explosive Trap, I think it has the downside of being too reactive a board clear, unless you spend another card to ping it (or can engineer its destruction through combat on the board somehow). If you want to play a control hunter, this Poor card will not help you much. 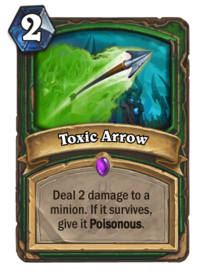 I feel like Blizzard designers enjoy publishing poor-quality Epic rarity cards, because Toxic Arrow is just bad. 2 damage for 2 Mana is very inefficient for a card. (I mean, you can play Arcane Shot to get 2 damage for 1 Mana, and you can target the opposing player if you want.) Worse yet, you can use it to bestow the Poisonous quality on a minion. This falls afoul of the fact that the kind of minion you want to make Poisonous is rarely the kind of minion who can survive taking two damage (1/3 minions excepted, of course). 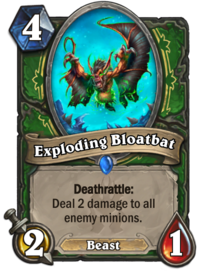 About the only good thing that can be said about this card and its effect is that at least you can reliably make a minion Poisonous, where you aren't guaranteed to do so using the Un'Goro Adapt mechanic. But I don't think that's enough to rescue this card from being Terrible. 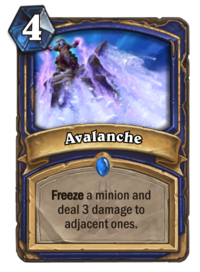 Avalanche is a spell that aims to support a Freeze Shaman deck. For the same cost as Cone of Cold, you freeze a minion and deal 3 damage to adjacent minions, for a maximum of 6 damage (twice that of Cone of Cold). Even though it doesn't damage the central minion, this card is definitely superior to Cone of Cold, because it can often kill the adjacent minions outright. The Freezing effect works with Moorabi and Ice Breaker. This spell is better than Fireball for controlling the board (because it can affect more minions), although it lacks the latter spell's flexibility. This is a Fair card with some potential, in and of itself, but it belongs in a deck - Freeze Shaman - that is does not yet have enough support, I think, to make it to the big leagues. 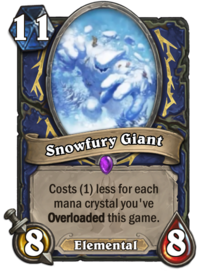 The Snowfury Giant is a very interesting and powerful card. It's the first class-specific Giant minion. It is a card that Shaman really needs to make Overload work well in a deck, getting a cost discount from Overloads, much like the Tunnel Trogg once did for aggressive shaman decks. (Incidentally, you don't often see Tunnel Trogg in Wild format right now; it's been displaced by aggressive Elemental/Jade board-flood decks.) If you want to have big minions, this plus Flamewreathed Faceless are your friends. This card is, in itself, Excellent. The problem is that with only two cards in Standard format (or three in Wild) that synergise with Overload, and given the constraints Overload imposes on your mana curve, it probably won't see play, at least not in Standard. In Wild, the N'Zoth control shaman deck, which uses Lightning Storm, Volcano, Earth Elemental and Jinyu Waterspeaker should be able to find a home for this card easily enough. Next up, some of the combat-oriented classes: paladin, rogue, and warrior. stuff going down right there. wipe his smug grin off his face. make spirit earl or vampiric duke. than nasty sharp pointy teeth. Dark Conviction is a spell with rather misleading art: one imagines a young, promising paladin being led astray by the dark power of a runeblade, as if this was the kind of spell you'd play on your tokens. But unless you're desperate for that extra bit of Attack value, you're almost always going to use this on big enemy minions in order to bring them in range of destruction with your weapons and Silver Hand Recruits. (That said, it does work as a buff on your own tokens when playing against aggressive decks, allowing them to trade into more stuff.) While cheaper than Keeper of Uldaman, it's probably strictly a downgrade since the latter card leaves a minion on your side of the board. 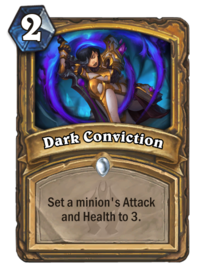 Dark Conviction isn't quite as good as Aldor Peacekeeper, since 3 Mana for a debuff and a 3/3 minion is IMO better than 2 Mana for a debuff spell, but there is something to be said for not leaving 1/8 minions on the board that can clear your tokens or that your opponent could conceivably buff later. Control paladin decks in Wild format won't replace Keeper of Uldaman with this, but those in Standard might find a spot for it. It's a Fair card. 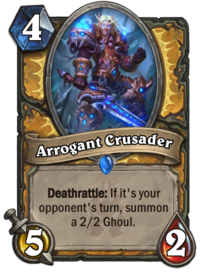 The Arrogant Crusader suffers from the same sort of problem as the Vryghoul, with the slight upside that 2 Health is a lot more durable than 1 (you can't just be pinged), and 5 Attack is big enough that you might actually benefit from the conditional Deathrattle effect. However, 2 Health is just not durable enough. You'll feel bad having the Arrogant Crusader taken down by a 1- or 2-Mana minion, almost all of which can trade into him. He might have been verging on being barely decent if the Deathrattle were unconditional, but as it is, he's still Terrible. 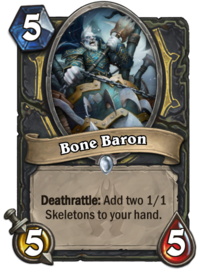 The Bone Baron gets you up to 7/7 in stats for 5 Mana. Not bad, except, of course, that the base minion is 5/5, and the two additional 1/1 minions are added to your hand, meaning you have to spend Mana to play them. 5/5 isn't the worst statline for 5 Mana, but it's not inspiring, and at any rate you're not playing minions just for statlines. The Deathrattle is just awful, and as a result, this card is Terrible. 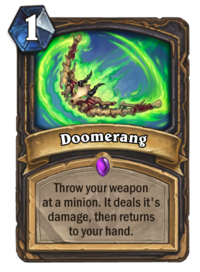 Doomerang is a neat effect whose power is basically wasted in a class like Rogue. 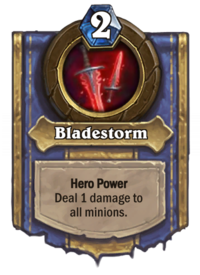 Since the nerf of Blade Flurry, Rogues have barely played decks relying on the power of their weapons. (And even when they did, they preferred to just equip their Hero Power weapons rather than use weapon cards.) Even in Wild, where one could conceivably play Tinker's Sharpsword Oil (which, pre-Blade Flurry-nerf, was a deck-defining card for Rogue), one just doesn't see much in the way of weapon use or buffing. A deck built around "burgling" cards from your opponents' class card list, and using discounted Obsidian Shard, seems to have been pretty short-lived. I'm not yet sure whether this spell uses up a point of your weapon's Durability. In and of itself, it's a strong card, but decks that might use it just don't seem to exist, and the other rogue class cards in this expansion don't really support its use, save, perhaps, for Leeching Poison. At the moment, I can't see my way to rating this any better than Poor. The Spectral Pillager has an under-performing body for a 6-Mana minion. It also has a poor Combo effect. 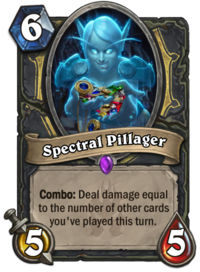 6 Mana is really expensive, because in order to get decent value from its effect, you have to play a lot of other cards, first. Miracle Rogue's current iteration can easily generate cheap spells to buff this minion's Combo effect, but what would you take out to put it in? It has the advantage over Arcane Giants of immediately dealing flexible damage that you can apply to any single minion or directly to your opponent, where the Giants have to wait until your next turn to act, but you can easily discount the Giants to 0 Mana. I mean, you could spend 10 Mana and 5 cards to get a 5/5 minion and deal 4 damage (plus whatever other effects you get from the other cards spent), but is it really worth all that effort to get a bonus Eviscerate? I think not, which is why this card is getting a Terrible rating. The Death Revenant is a really under-powered minion, what with its 3/3 body for 5 Mana. Its Battlecry effect could make it worthwhile, but you need an awful lot of damaged minions to do so - at least 3 minions altogether just to make this card worthwhile. 4 or more damaged minions and it starts to look good. That said, it's like a variant of Frostwolf Warlord, and that card isn't seeing play in modern board-flood decks. Although warrior has a lot of ways to damage the board, I don't expect this card to see play, either. If you want to put a big minion on the board with damaged minions, you're probably better served by King Mosh, just as board-flood decks tend to prefer Sea Giant. 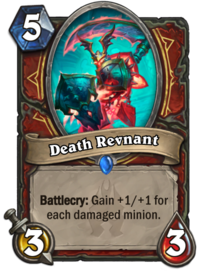 Death Revenant is probably just good enough for use in budget decks to be rated Poor. 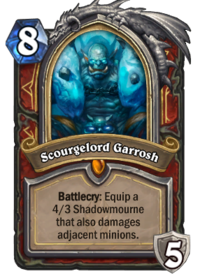 Next up, the warrior death knight Hero card, Scourgelord Garrosh. "It's raining men", does, ya know? The weapon, on the other hand, is an incredible tool for board control. While Gorehowl is strong, it hits one minion at a time, and its strength wanes with each swing. Shadowmourne, on the other hand, keeps 4 Attack for each of its three swings, and if your opponent has built up a board, you can use it to efficiently clear it off, seeing as you can damage up to nine minions while only hitting three of them. If you extract maximum value from both weapons, Gorehowl can do a maximum of 28 damage, while Shadowmourne can do a maximum of 36. 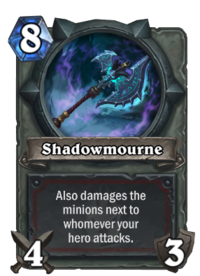 What's more, you can probably get away with swinging Shadowmourne at your opponent's face, where doing that with Gorehowl (unless it was part of a game-ending turn) removes the weapon. I'm not quite convinced this is a super-strong Hero card, but it's at least Good, which should be good enough to see play. Gul'dan gets a section all to himself, on account of all the mage and priest cards already having been reviewed. friends for me to review. 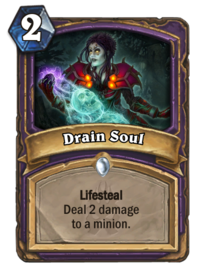 Drain Soul is mostly a straight-up upgrade of the Drain Life spell. It costs 1 less mana and has the same basic effect (deal 2 damage to heal 2 Health). 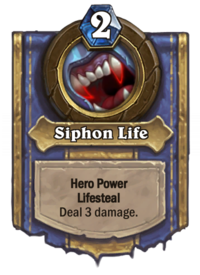 Unlike Drain Life, if you boost the damage with Spell Damage (courtesy of Bloodmage Thalnos, say), you also boost the healing because it comes via Lifesteal. The only thing better about Drain Life is that you can use it on heroes. This can replace Darkbomb's function in Standard format in, say, a "highlander" warlock deck, but I don't really expect it to see much use in other warlock decks. Taken on its own, it's a Fair card. And now for the final card to be reviewed, the warlock death knight Hero card, Bloodreaver Gul'dan. Bloodreaver Guldan costs 10 Mana, which is an awful lot. In exchange, you get a pile of demons (assuming you played them) back, much like N'Zoth, 5 Armor, and what might be the best Hero Power of the set. For 2 Mana, you can deal 3 damage to any minion or to the opposing Hero, and get back as much Health as you deal damage, for a 6-point swing in Health. That, dear reader, is value. Much like N'Zoth or Anyfin Can Happen, your Battlecry is probably wasted if you play a deck that floods the board with low-value demons. Instead, you probably want to have a specific set of powerful demons, doing your best to play Bloodreaver Gul'dan once you've lost at least in the range of 7-8 Mana worth of demons, though resurrecting a full or nearly-full board is obviously the objective. (I've already seen a "theorycraft" highlander deck with Krul the Unshackled, for instance.) If you happen to run this card and Jaraxxus, you could also use it to resurrect Jaraxxus' stream of Infernals if you didn't run any other demons in your deck. 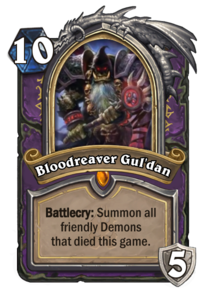 For all of Bloodreaver Gul'dan's strengths (and especially that glorious, delicious Hero Power), I'm not actually sure I can rate him better than Fair. First of all, by the time you're playing him (ideally after you've just about exhausted your opponent's resources), you likely won't get any mileage out of his Hero Power. Second, he's awfully slow at 10 Mana. (Have I mentioned that already?) Third, if you play him too early, your big board might be vulnerable to a big board clear, or you might just not get much value out of his battlecry. (That said, it's not terrible to bait out a board clear when you have more board-filling options to come, and playing him earlier means you get more value out of his Hero Power.) Fourth, at least as far as I can see, he fits comfortably in one deck archetype, which feels a bit disappointing. He's a strong choice for a highlander deck, though, and might shove out N'Zoth as a board-filling finisher for that archetype (or at least become an alternative to N'Zoth). All done! Whew! I need to start doing these reviews as videos or something.